Wingspan about 32 mm. 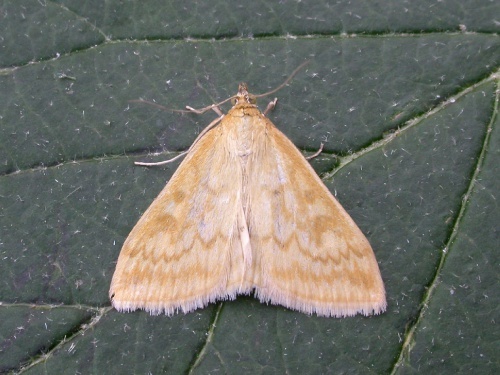 It has a resemblance to Ostrinia nubilalis but has subtle differences in the forewing and a more strongly-marked underside. The adults fly in June and July. They are attracted to light, but are also readily disturbed by day. The larva feeds on a number of plants such as creeping thistle, broom and goosefoot. Distributed mainly in the southern half of England, Sitochroa verticalis is resident but also a sporadic immigrant, reinforcing the population from time to time. In the Butterfly Conservation's Microlepidoptera Report 2011 this species was classified as local.